Committee for Melbourne is pleased to note some serious infrastructure investment commitment for Victoria in this week’s federal budget, which goes some way to addressing the imbalances in investment in Victoria compared to other Australian jurisdictions. At the same time, we continue to call for a more integrated approach to infrastructure planning and investment within and across jurisdictions and for greater alignment between projects selected by governments to suit electoral objectives with advice from their independent infrastructure agencies. As we advocated to the incoming Victorian government ahead of the State election last year, we will be calling on the next Federal Government to commit to bold, visionary policies to help sustain Australia’s liveability, and ensure we remain a prominent location of choice for homegrown and international talent and capital. Transport will once again be at the top of our list. Among other things, we will be reminding the new government to stick to its commitment to work with the Andrews government to build a world-class Melbourne Airport Link by 2027, and not to allow this to slip to 2031. This is important not only for Melbourne and Victoria’s brand, but will boost connectivity and hence productivity all along the Eastern Seaboard so critical to ensuring that Australia can be a successful 21st century country in a competitive, booming Asia-Pacific region. Last year the Committee held a workshop, in conjunction with Foundation for Young Australians (FYA), on ‘Future Skills’ - a critical strategic need identified in Melbourne 4.0. From the workshop, a working group was formed to address how Greater Melbourne could become a city that promotes life-long learning as core to its cultural and civic identity. Our “Futures Skills” Working Group identified the Australian Qualifications Framework (AQF) review as an opportunity to submit practical ideas for how to respond to this need. After deliberation by members of the working group, the Committee surveyed our members on their thoughts on how to promote life-long learning for Greater Melbourne. As a result, the Committee recommended that the AQF formally recognise micro-credentials, in consultation with employers, which would ease transitions across the workforce, more rapidly fill skills gaps and promote lifelong learning. Thank you to Kirsty Ritchie, Arts Centre Melbourne, Melanie Machin, Vanguard Investments, and Calum Lindsey-Field, FYA, for leading the working group and to all the members who offered their valuable feedback on the submission. This submission has led to an exciting partnership with World Skills Australia and the Department of the Future, which will be announced next month. Read the full submission and contact David Prior, Project and Policy Officer for further information. It’s time to welcome another generous sponsor for this year’s Annual Dinner. We are pleased to welcome our newest Event Partner, Sofitel Melbourne on Collins. The prestigious Sofitel will be providing after dinner digestifs. They are currently in covert discussions with our Presenting Partners, Melbourne Convention and Exhibition Centre, about a very special dessert, cheese and beverage concept, which will truly inspire you and your organisation to “Think Big”. Don’t forget to book your table soon, Book Here! Or contact our Events and Engagement team for further information. 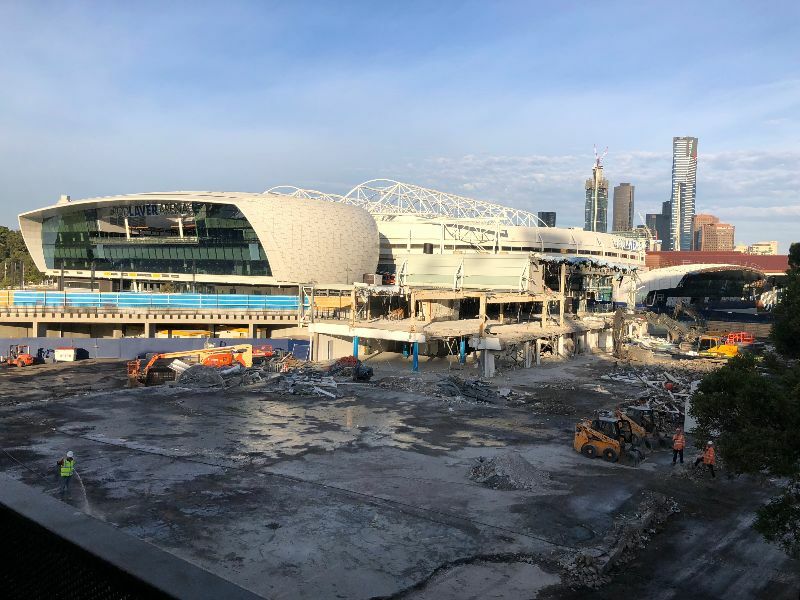 The third stage of the high-profile Melbourne Park redevelopment is in full swing with major demolition works being conducted by City Circle. The renewal will see a new function and media centre featuring pre-event spaces, interview rooms, a 200-seat auditorium and broadcast studios. These renovations will help to heighten the overall events experience and give media a picturesque backdrop of Melbourne’s skyline, showcasing our city to the world. On Wednesday 3 April, at a media call with Melbourne Olympic Parks Trust and Development Victoria, together with the Minister for Tourism, Sport and Major Events, Martin Pakula and Minister for Priority Precincts Gavin Jennings, demolition works ahead of the construction of a new function and media centre were inspected. 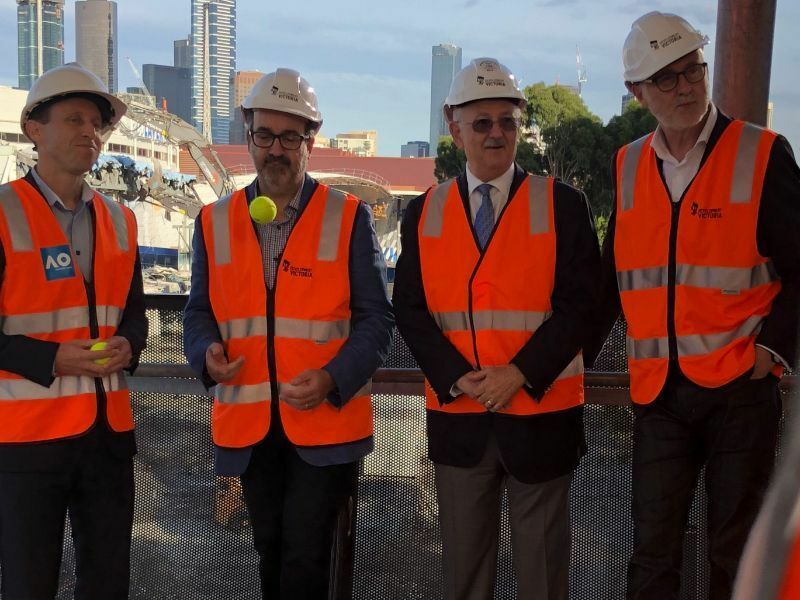 “Melbourne is the sporting and events capital of Australia ad we maintain that title by continuing to invest in the best facilities, venues and infrastructure with projects like the Melbourne Park redevelopment” Martin Pakula, Minister for Tourism, Sport and Major Events said. Stage 3 works are scheduled to be completed by the 2023 Australian Open. 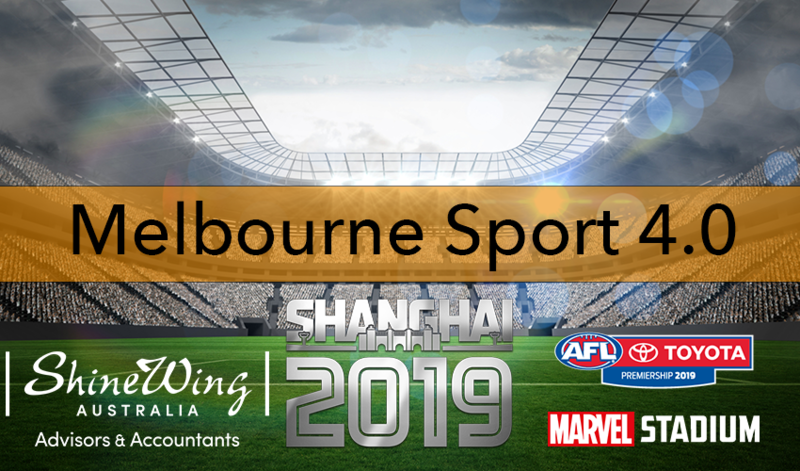 Committee for Melbourne in conjunction with the AFL and ShineWing Australia is excited to announce the first 2019 Melbourne 4.0 ‘Future of Sports Forum’ hosted at Marvel Stadium's Quill Room overlooking the arena. 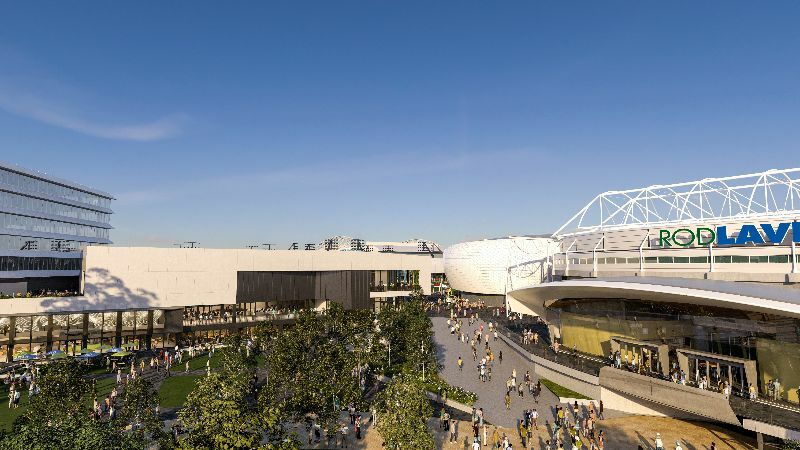 The event will look at Melbourne, a city recognised globally as the sporting capital and leading in the 'business of sport,' a unique billion-dollar industry in Victoria. This exciting discussion will be led by an expert panel comprising Danny Armstrong, Managing Partner, ShineWing Australia and Dave Stevenson. The panel will be moderated by Clive Dwyer, Director of Engagement, Committee for Melbourne. To join this event, please contact Laura Kerr Melvin. Places are strictly limited. 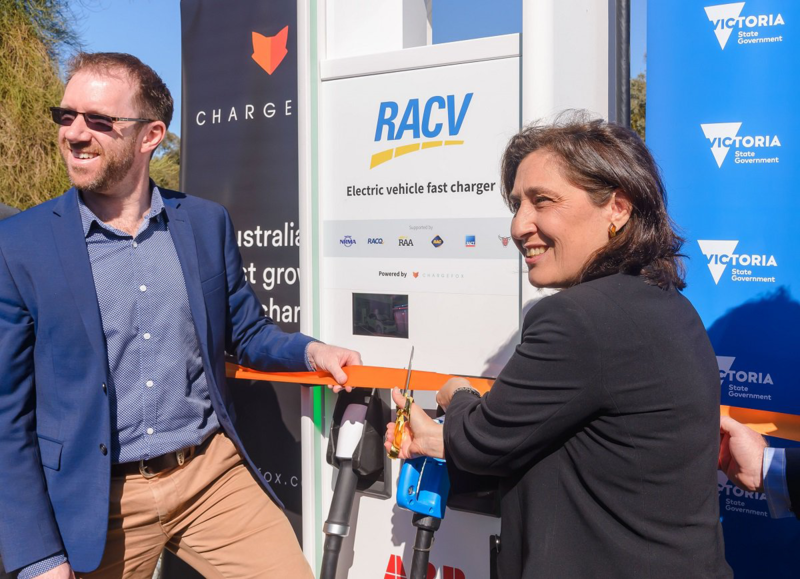 RACV, alongside several motoring clubs across Australia, have invested in Chargefox, to build 21 new charging stations for ultra-rapid electric vehicles (EV) across Victoria. Pictured: Chargefox CEO, Marty Andrews, and Victorian Energy and Environment Minister Lily D’Ambrosio open an ultra-fast charging station. 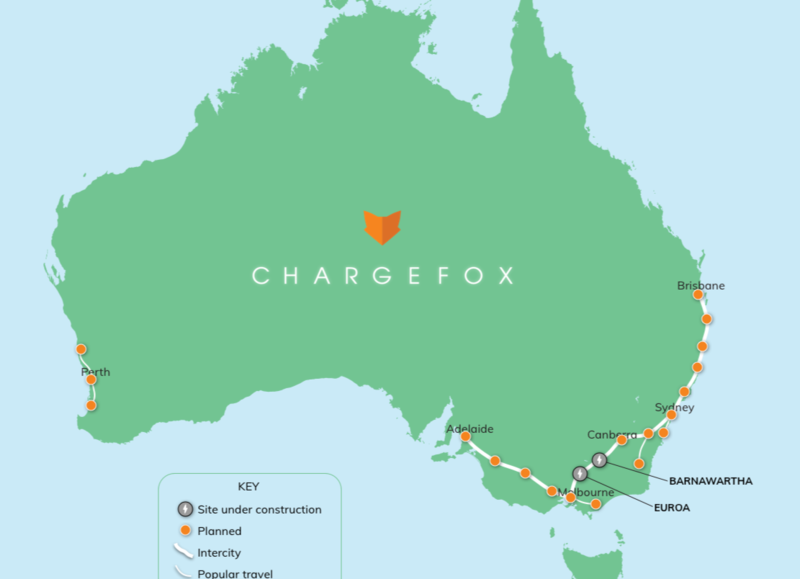 This initiative will connect the Eastern Seaboard, through what will be Australia’s largest fully renewable energy ultra-rapid charging system. “There is a growing trend in the market of battery-powered and hybrid vehicles, so charging will undoubtedly become an important part of our members’ journeys in the future. This investment and partnership alongside the motoring Clubs across Australia provides people with an extensive and trusted ultra-rapid charging network. One of the major barriers that limit the adoption of electric vehicles is their driving range, so this provides access to a quality network which helps to alleviate that anxiety,” Said RACV’s Public Policy and Corporate Affairs General Manger, Bryce Prosser. To read the full RACV press release, click here. To learn more about the Eastern Seaboard Collaboration Taskforce, click here. 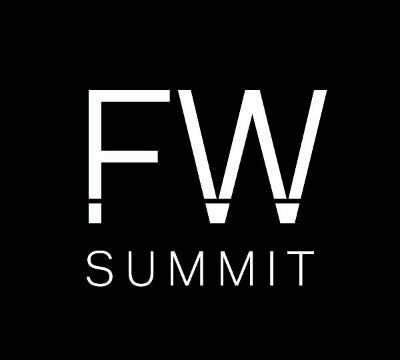 The Future Work Summit gives delegates and their teams the opportunity to learn from diverse industry experts who have already taken action to " future proof " their businesses and workers. Delegates will learn how to maximise productivity, create a forward-thinking workplace culture, streamline business processes and gain insight into the technology and data driving the workforce of the future. For Committee for Melbourne member discounted tickets, click here. Last month, Fintech Australia announced its plans to relocate their headquarters from Sydney to Melbourne, helping cement Melbourne’s reputation as the technology centre for Australia. This move will contribute $47 billion per annum into the Victorian economy and employ over 120,000 people. Click here to read the full press release from the Minister of Jobs, Innovation and Trade. At the Committee, our Artificial Intelligence taskforce has been created to develop a set of recommendations for the State and Federal Governments for Greater Melbourne to adapt and benefit fromthe challenges and opportunities presented by Artificial Intelligence. 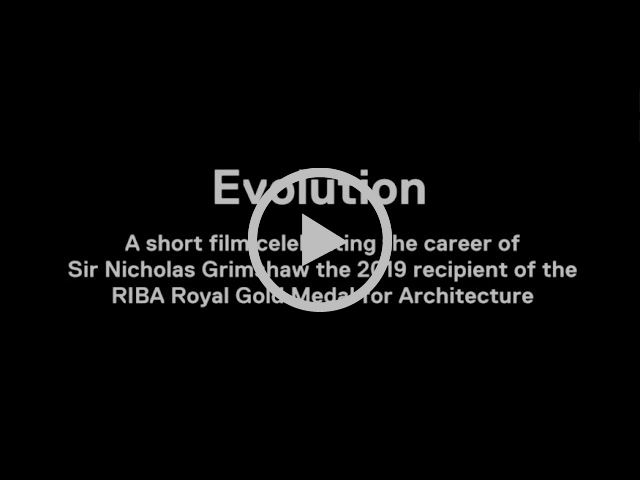 On 14 February, Sir Nicholas Grimshaw was awarded the 2019 Royal Gold Medal, the UK’s highest honour for architecture, at a special ceremony at the Royal Institute of British Architects (RIBA) in London. Approved personally by Her Majesty the Queen, the Medal is awarded to individuals who have had a significant influence on the advancement of architecture. The Lubetkin Prize winning Southern Cross Station design was the first project undertaken by Grimshaw in Australia, which led to the formation of the Melbourne and Sydney offices in the early 2000s, bringing Sir Nicholas Grimshaw’s commitment to innovation, rigorous approach to detailing and reputation for excellence to Australia. “Nick’s legacy continues to permeate our approach to architecture in each and every studio and as we continue to expand our global reach, we are particularly proud to be playing our part in helping to shape our local home city of Melbourne and to drive and influence projects across the wider region. At a time when our cities’ populations are growing exponentially, we believe the architect’s role in creating sustainable projects for our communities is more important now than ever before”, noted Grimshaw Melbourne Managing Partner, Neil Stonell. 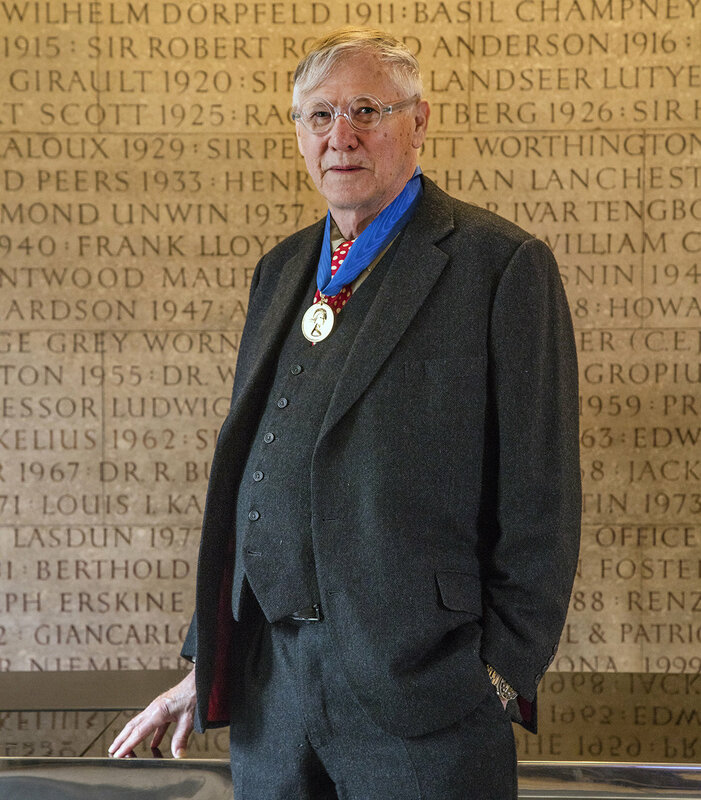 Receiving the UK’s highest architecture accolade, Sir Nicholas Grimshaw said, “I’m amazingly thankful, it does really give a sense that there’s that feeling of warmth for what you’re doing, what you’ve done in your life”. 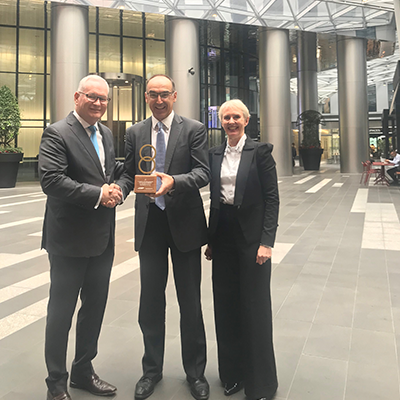 Gerard Dalbosco, EY’s Managing Partner and Committee for Melbourne’s board member, accepted the Committee trophy for 27 years of membership and their commitment to building a better working world for Melbourne. 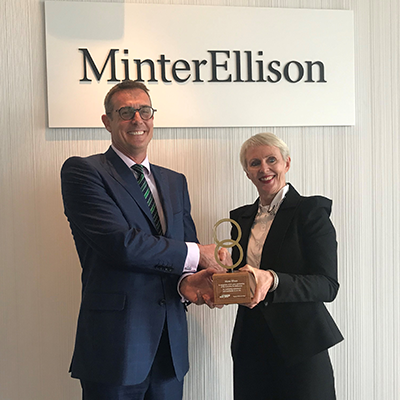 Last month, we presented Minter Ellison with a Committee trophy. Recognition of 25 years of membership and supporting our community in varying facets.